These Cheese Stuffed Garlic Rolls are even better than garlic bread because they have a surprise in the middle. When you bite into them, you will find warm ooey, gooey, stringy Mozzarella cheese in the center and sprinkled with delicious parmesan cheese to top it off. If you love bread especially with Garlic, Butter, Mozzarella and Parmesan Cheese, you will love these easy Stuffed Parmesan Rolls. Who does not love ooey gooey, stringy cheese? These rolls are not only delicious and make the perfect side dish, they are also so easy to make using Frozen Dinner Rolls! 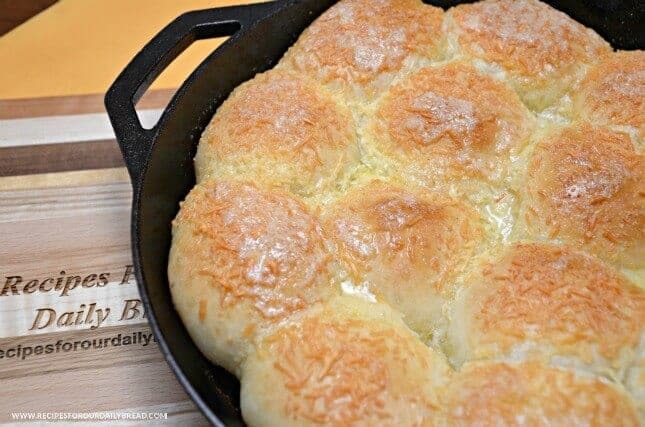 I am always looking for new things to serve and my family cannot get enough of these stuffed cheese dinner rolls! While they do take some time to let the bread rise, they are very easy to make and they are great to serve a crowd! This recipe was from one of my amazing contributors, Diane Roark. 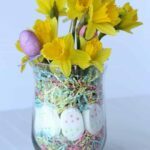 Diane blogs at Recipes for our Daily Bread. She has made tons of great recipes and you must go check them out! 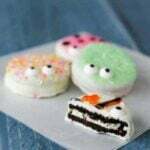 As I mentioned, they are super easy to make. You simply let the frozen rolls thaw, stuff them, and bake them. These rolls are super simple to make, but you need to allow plenty of time for the rolls to rise. Use shredded Parmesan cheese. I like the shredded cheese better than grated Parmesan cheese on these rolls. 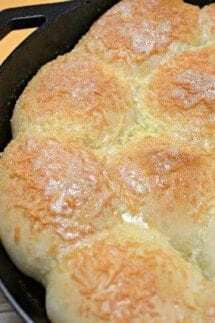 What to serve these easy dinner rolls with? 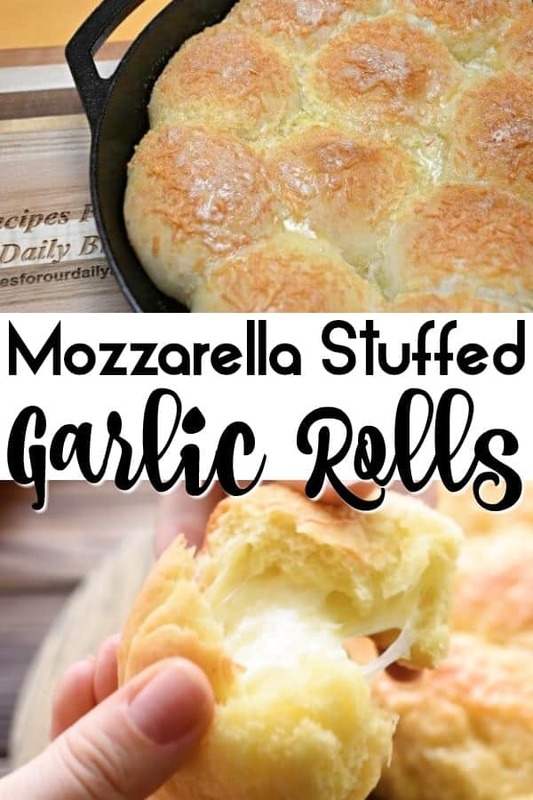 These Stuffed Mozzarella Rolls are even better than garlic bread because they have a surprise in the middle. When you bite into them, you will find warm ooey, gooey, stringy Mozzarella cheese in the center. Place the frozen dough in a greased cast-iron skillet or baking dish. Place another skillet or large dish over the dough and allow the dough to rise for 1 hour. Stuff each roll with a piece of Cheese. Place them back in the cast-iron skillet. Allow them to rise another 2 to 3 hours, until they double in size. Mix together the garlic and butter and brush half of the mixture on the rolls before baking. Remove from the oven and brush with remaining garlic butter. Thank you again for letting me share these stuffed parmesan rolls. They are truly easy to make and so delicious it is hard not to eat every one of them. Thank you for your kind words about my stuffed Parmesan rolls. I love bread too. These rolls are so cheesy and extremely tasty. I have been making way to many of them. Oh, these rolls are fantastic and would go with about any meal or make a terrific snack too! Thank you so much for sharing these little gems of goodness and yumminess; I can’t wait to make them. Will be sharing and pinning this recipe for sure!!! I have not thought about eating them as a snack but I totally agree. 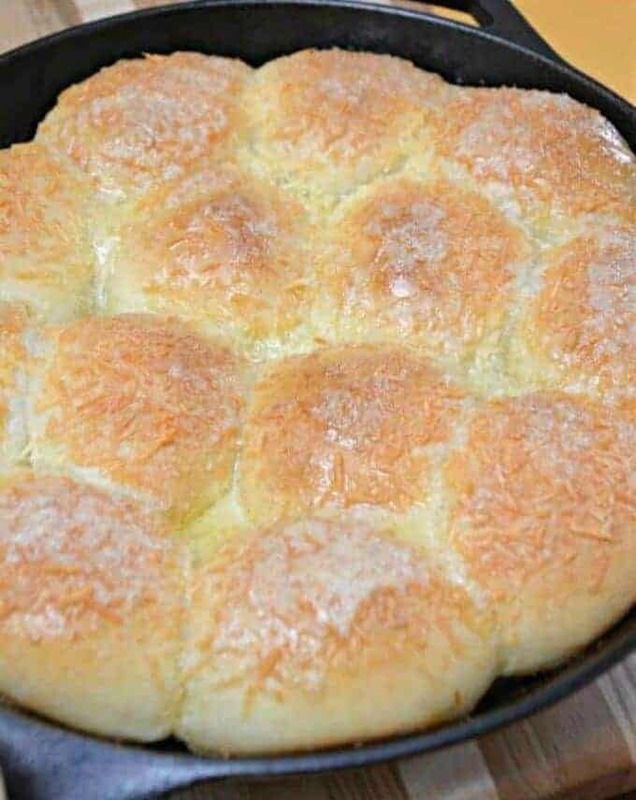 I make a huge skillet full of these rolls and we are always fighting over them.